(Phys.org) —A wearable pressure sensor that is both highly sensitive and cheap to produce could aid the development of prosthetic skin, touch-on flexible displays and energy harvesting, as well as changing the way vital health signs are monitored. Researchers from Monash University's Departments of Chemical Engineering and Mechanical and Aerospace Engineering, and the Melbourne Centre for Nanofabrication, produced the new sensor by sandwiching ultrathin gold nanowire-impregnated tissue paper between two polymer sheets. Researcher Dr Wenlong Cheng said the sensor had great potential for monitoring people's health anytime and anywhere. "The sensors are flexible, yet robust and our testing showed they could be used for checking such things as blood pressure, blood pulse and heartbeat. These results have particular implications for future 'at-home' diagnostic tools for elderly or disabled people," Dr Cheng said. Unlike current pressure sensors, which rely on brittle semiconductor material, the new sensor can be bent or twisted without cracking. The researchers used gold nanowire because of its ability to be highly flexible while maintaining high conductivity. "We chose the ultrathin gold nanowires because they are mechanically flexible and have good conductivity, yet are very robust which makes them highly suitable for wearable devices," Dr Cheng said. The nanowire used in the sensor is about two nanometres thick - a nanometre is one billionth of a metre - and is the thinnest gold wire produced. 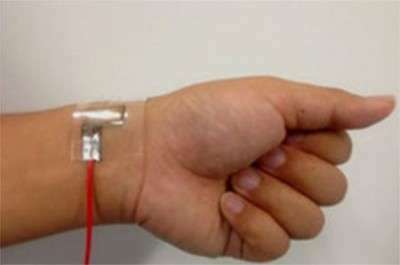 The sensor's robust flexibility means it could be worn as a diagnostic device, for example to detect blood pressure or pulse in real time and under various conditions, including during exercise or sleep. It also has potential use in a range of other applications, including detecting acoustic vibrations and in flexible displays that could supersede hard tablet or phone touch screens that are subject to cracking. The sensor has the added advantage over current versions that it does not need expensive equipment or costly cleanroom conditions to produce. Dr Cheng said an exciting aspect was that while the team had only produced a patch-size sensor, the fabrication process could easily be replicated on a much larger scale. Why is there no discussion of how the sensor actually works? Is it working as a sort of strain sensor? Is it picking up electrical signals like an EMG? From the article it just sounds like some fancy gold wires in some tissue paper. Without purchasing the paper there is no way of telling.